By producing some of the highest resolution images of peptides attaching to mineral surfaces, scientists have a deeper understanding how biomolecules manipulate the growth crystals. This research may lead to a new treatment for kidney stones using biomolecules. The research, which appears in the Nov. 23 online edition of the journal Proceedings of the National Academy of Science, explores how peptides interact with mineral surfaces by accelerating, switching and inhibiting their growth. 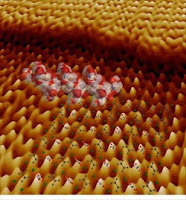 The team, made up of researchers from Lawrence Livermore National Laboratory, the Molecular Foundry at Lawrence Berkeley, the University of California, Davis and the University of Alabama, for the first time produced single-molecule resolution images of this peptide-mineral interaction. Inorganic minerals play an important role in most biological organisms. Bone, teeth, protective shells or the intricate cell walls of marine diatoms are some displays of biomineralization, where living organisms form structures using inorganic material. Some minerals also can have negative effects on an organism such as in kidney and gallstones, which lead to severe suffering and internal damage in humans and other mammals. Understanding how organisms limit the growth of pathological inorganic minerals is important in developing new treatment strategies. But deciphering the complex pathways that organisms use to create strong and versatile structures from relatively simple materials is no easy feat. To better understand the process, scientists attempt to mimic them in the laboratory. By improving the resolution power of an Atomic Force Microscope (AFM), the PNAS authors were able to image individual atomic layers of the crystal interacting with small protein fragments, or peptides, as they fell on the surface of the crystal. “Imaging biomolecules that are weakly attached to a surface, while simultaneously achieving single-molecule resolution, is normally difficult to do without knocking the molecules off,” said Raymond Friddle, an LLNL postdoctoral fellow. The images also revealed a mechanism that molecules can use to bind to surfaces that would normally repel them. The high resolution images showed that peptides will cluster together on crystal faces that present the same electronic charge. Under certain conditions the peptides would slow down growth, while under other conditions the peptides could speed up growth. On another face of the crystal, where the peptides were expected to bind strongly, the researchers found instead that the peptides did not attach to the surface unless the crystal growth slowed. The peptides needed to bind in a specific way to the face, which takes more time than a non-specific attachment. As a result, the growing layers of the crystal were able to shed off the peptides as they attempted to bind. But when the researchers slowed down the crystal growth rate, the peptides collapsed onto the surface so strongly that they completely stopped growth. The researchers proposed that the phenomenon is due to the unique properties of bio-polymers, such as peptides or polyelectrolytes, which fluctuate in solution before resting in a stable configuration on a surface. He said designing polyelectrolyte modifiers in which the charge, size and ability to repel water can be systematically varied would allow researchers to create the equivalent of “switches, throttles and brakes” for directing crystallization.